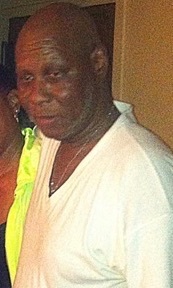 A motorist struck and killed 63-year-old Barney Pinkney as he crossed the street in Harlem Tuesday. NYPD blamed the victim in the press. According to the NYPD public information office, the victim was crossing Morningside Avenue at 124th Street, west to east, when the driver, northbound on Morningside, hit him with a Saturn SUV. Pinkney suffered head trauma and died at St. Luke’s Hospital, police said. The NYPD account of the crash focused on the victim’s behavior, with few details on the driver’s actions, and leaves many questions unanswered. Morningside Avenue and 124th Street is a T-intersection with an unmarked crosswalk on Morningside. 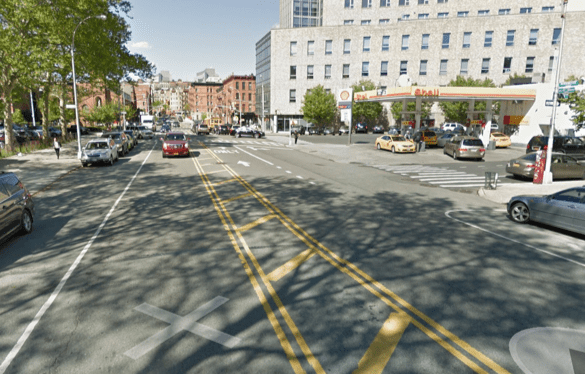 A DOT road diet implemented in 2014 added center pedestrian islands and extended sidewalks at some Morningside crossings, but improvements at 124th Street were not included. The NYPD public information office could not say how fast the driver was going — a crucial factor in the severity of the victim’s injuries — or why the driver failed to stop for someone crossing the street. Police did not charge or ticket the motorist who killed Pinkney, identified as a 75-year-old man from Queens. NYPD usually shields the names of drivers who aren’t penalized for killing people. Speaking to the Daily News, Russel Lowery, the victim’s brother, said Pinkney was an Army veteran. “He was just crossing the street,” Lowery said. The crash that killed Barney Pinkney occurred in the 26th Precinct and in the City Council district represented by Inez Dickens. The city council members who changed the law to allow parking at T-intersections and removed the legal unmarked crosswalks have blood on their hands. This is not the first time a pedestrian has been killed like this and it will not be the last. I want a PSA from NYPD to pedestrians and cyclists saying that if you’re doing the slightest thing illegal or even unwise, drivers can just kill you without criminal consequences. “Remember, you can be on a straight road in broad daylight, with a car a block away, and if you’re not in the crosswalk the driver can accelerate and mow you down. If you’re a child and not holding your parent’s hand, the driver can just smash you. If you’re an elderly person, they can just kill you anywhere, since you are likely disoriented. And, of course, if you’re on a bike, they can kill you with impunity no matter what. Remember, your obligation is to stay off the streets as much as possible, and be prepared for death at all times. Ugh, I knew it would be something like this. DOT needs to mark all of these crosswalks NOW. Even after the street redesign, crosswalks at all of the unsignalized intersections are still unmarked. You’re still not safe in a marked crosswalk, but it’s a million times worse if the crosswalk is unmarked. “Remember, your obligation is to stay off the streets as much as possible, and be prepared for death at all times, even if you’re on the sidewalk or in a building“. NYPD needs to be shut down with extreme prejudice. Half of the cops belong in federal prison for life. According to NYPD protocol, if a cop is standing on the sidewalk and you run the cop over with a car, no ticket, no arrest; just an accident. Or do you think maybe they’ll be a bunch of bigoted criminals and start complaining if they start getting run over? I think maybe 30 or 40 cops need to be run over before they’ll realize that vehicular manslaughter is a CRIME. Not true. Hitting a policeman is different.They put their life on the line every day for us and the least we can do is recognize the professional courtesy they get of being treated better than everyone else by the law and by their colleagues. The victim was nypd ! Cuba cops are chosen by the community !